Wednesday has finally come and that means new tires and brake pads arrive! I'm going to run Mazda OEM pads again because for $60 per set you can't beat their balance of performance and long life. They will sit in the garage with the fresh rotors until next week when I can enlist some friends to assist with a full brake job, including bleeding the old fluid. 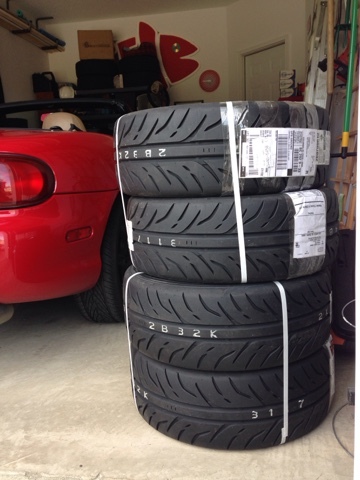 In the tire department the Miata will be wearing brand new Dunlop ZII Star Specs in 205/50/15. These are pretty popular autocross and track day tires that are as sticky as we are allowed to run in Stock classes. This moves both NMS cars onto the Dunlop compound for the 2015 season. The all season tires that came with the car were pretty shot and looked like the previous owner was trying to drive a little too fast with them as chunks of rubber were coming off the outer edge. 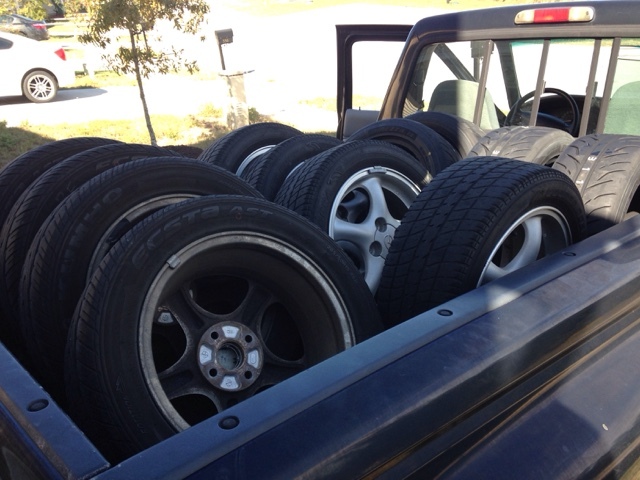 I loaded up the trusty Ranger with the new rubber, the silver rims that came with the car and the older set of rims I painted black that still had the newer all seasons I put on last year for when it got too cold for the summer tires on the Mazdaspeed. The guys at the local tire store did a great job of quickly discarding the bad tires that came with the car, moved my good all season rubber to the silver rims and the new sticky Dunlops onto the black rims. I'm now back to a performance set of wheels and an everyday/cold weather set of wheels. Now we wait for Darlington to really break them in! 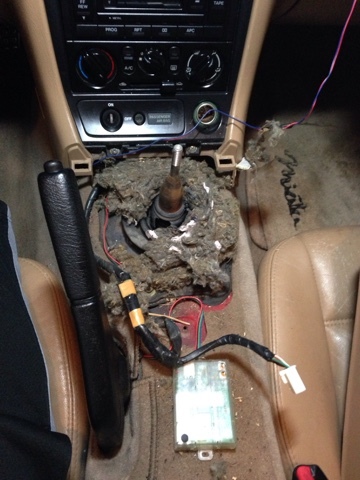 As a final project today, I took a peek under the center console and at the shifter boots that block dust and junk from getting into the transmission and the interior of the car. 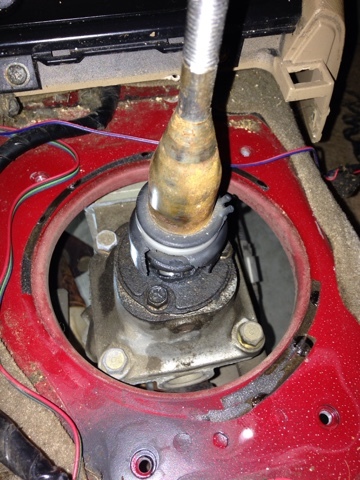 As I suspected, all of the rubber boots are ready for replacement and some cleanup was needed. It was interesting to peer down through to see through the car and also get a look at the aftermarket security system thing that is installed. 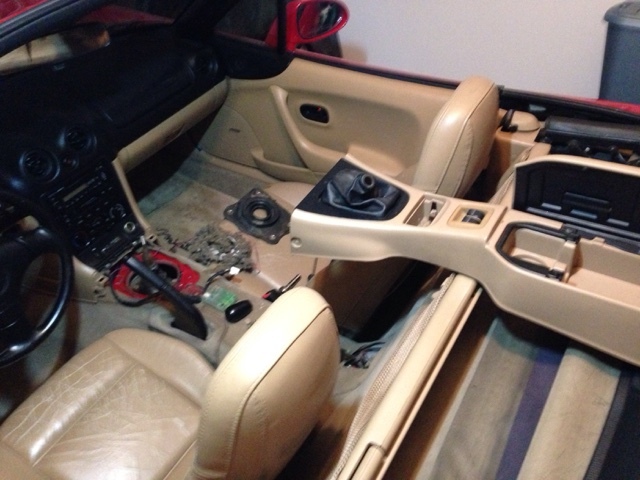 Time to order some shifter parts and do some more install work next week! Good thing your truck holds 12 wheels!